The NBME Medicine Shelf is a sprawling exam. It covers a wide range of diagnoses and conditions and floods over into other specialties including pediatrics, OB-GYN and, most predominantly, surgery. Its difficulty becomes all the more complex as you dive deeper into your studies and more granular topics like cardiology, hematology, oncology, rheumatology and pulmonology come into view. Where will you find a robust enough resource that covers all the information needed, and gets straight to the point? AMBOSS makes the Medicine Shelf exam an easy pill to swallow. Navigate through the minutiae of the material with a Qbank featuring 1000+ NBME-style medicine questions. 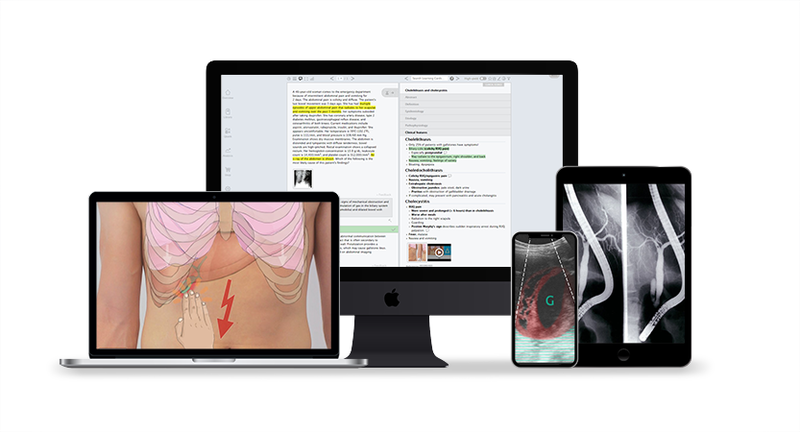 Should you get stuck at any point during your study sessions, smart features like the Attending Tip and the Highlighting Tool guide you through each diagnosis. When questions and answers aren’t enough, refer to the cross-linked Knowledge Library and get the bigger picture. There, you’ll find diagnostic pathways, procedures and materials like X-rays, ECGs, CTs and MRIs that allow you to dive into a variety of pathologies and cases. This high-yield, interactive content helps train your clinical eye, and case-based scenarios give you the chance to interact with illnesses and conditions you’re not likely to run into on the wards. You’ll find AMBOSS an essential resource for honing your ability to recognize a pathology as soon as you see it. Plus, both the Qbank and Knowledge Library can be accessed anytime, even offline, thanks to our iOS and Android apps. You’ll get to keep up with your studying on the wards and on-the-go.